Chef Batra has spent 20 years in culinary management inspiring hotel guests and patrons throughout Canada, the United States and international markets with his culinary creativity and expertise. His philosophy towards cooking relies on using the highest quality ingredients possible and applying a hint of fusion or a contemporary twist to highlight those ingredients. While completing his Bachelor of Arts, Chef Batra’s professional path began with learning the culinary fundamentals at the Maurya Sheraton in New Delhi. From Delhi, Chef Batra began his international journey of culinary passion that has seen him work in India, Bahrain, and the Sultanate of Oman before immigrating to Canada in 1994. Under the mentorship of Chef Fred Zimmerman, also the captain of Team Canada at the Westin Calgary, Chef Batra had the opportunity to work beside the veteran chef and share creative ideas. 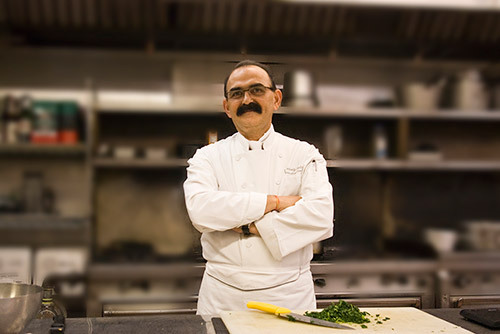 After dedicating five years to the Westin Calgary, Chef Batra moved on to another challenge at the Sheraton Suites Eau Clair in Calgary. His hunger to further stretch his culinary artisan took Chef Batra across the border to the Westin Waltham Boston in Massachusetts for seven years. Chef Batra came back to Canada in 2013 where he spent an additional four years honing his craft at the Westin Prince Hotel Toronto. Chef Batra joined the Cambridge Red Deer Hotel & Conference Centre in the summer of 2017. He brings an abundance of hospitality experience to his role as Executive Chef. Inspired by his local and global experiences, Chef Batra is helping to recharge and renew our guests’ palates with his innovative take on national and international favorites. Chef Batra has received many awards for his passion and commitment to the culinary arts, from winning the Alberta Hotel and Lodging Association’s Gold Key Award to being named a finalist for the prestigious White Hatter Award. In 2015, Chef Batra had the honour of working with Kraft Canada, where he had the opportunity to promote Kraft Products as the Executive Chef of choice and work closely with their marketing team. Chef Batra is excited to wow guests with his comprehensive knowledge of Canadian, Indian, Arabian, Mediterranean and Asian, Californian, and South West American cuisines.